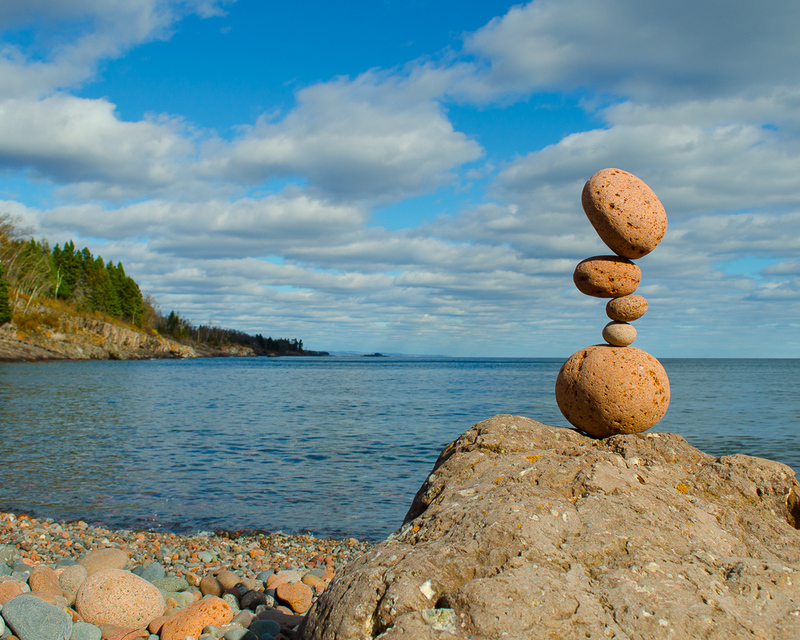 I do most of my work along the North Shore of Lake Superior. The big blue lake makes a great background, and the variety of rocks is endless. All images are available for purchase in several formats. See the purchase prints page for details. 2013: Got up early to work at Lamb's Resort in Schroeder, MN. 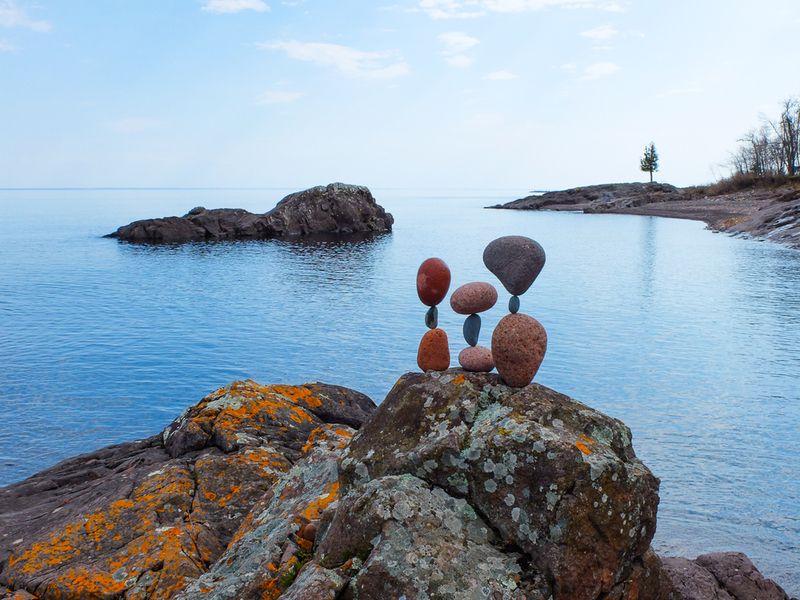 I had to create the balances before the sun came up. Coffee helped. 2013: One of my favorites. 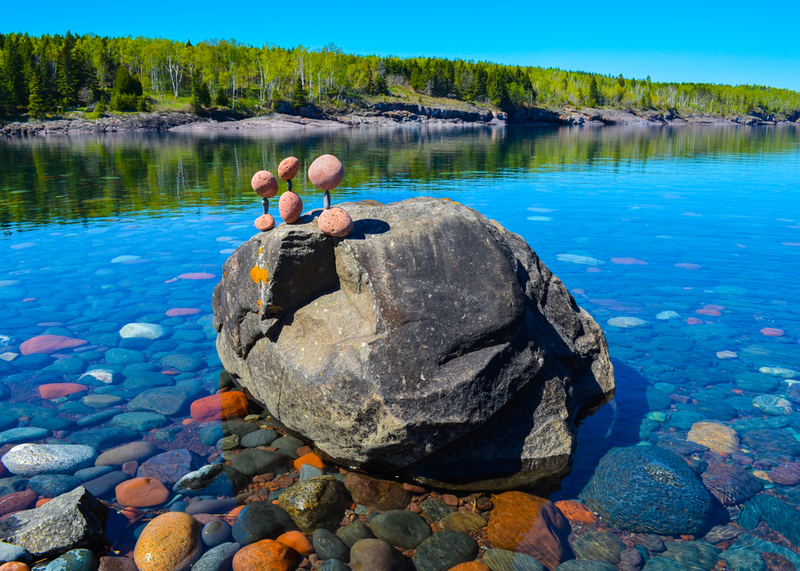 Taken at Sugarloaf Cove on Lake Superior. I haven't done a lot in this stacking style, but plan to explore it further. Trying out some new color tones. Retro postcard? Quite a large stone, about the size of a watermelon. Difficult to balance because you can't lift easily. You have to "walk" it around and feel the very subtle changes in its desire to fall, or not fall. Balancing some cool orbs in the front yard. 2013: It's difficult to balance a large round stone on a slender support. Experimenting with relationships in color and shape. 2013: A late-blooming favorite. This image sat almost unnoticed until I reviewed some originals for my 2014 Arboretum exhibit. Sometimes looking back again pays off; People have responded enthusiastically to this photo. 2011: That's a water drop hanging from the top rock. I enjoy the tiny slices of daylight that sometimes peek between the rocks. 2013: As my friend John Felice Ceprano teaches: The spaces between the stones are just as important. I am looking forward to exploring this concept. 2013: Go ahead, anthropomorphise all you want. 2013: More dabbling in shape and color relationships. 2012: Mouth of Cascade River, Lake Superior. 2010: Like some others, this photo sat in a folder, unloved, for a while. When I printed it to fill a last slot in my 2011 Arboretum show, I didn't imagine it would be the best-selling photo there. We are not always the best judges of our own work. 2012: Part of a series of "stack on balance" photos of the same piece from several times and angles. 2011: Named for the time it was created and the number of rocks that make it up. 2010: I build this sculpture on a pleasant October afternoon. With the wind and waves, I rushed to get some photos, expecting it to blow over at any moment. After working on other beaches and getting dinner in Grand Marais, I retuned to find it still standing as the sun set. With my motel near this beach, I got up before sunrise to create some new pieces to photograph during the golden hour. I was very suprised to find it, standing blithely while the waves and spray raged. 2010: An early favorite piece; a newly rediscovered photo. 2012: Created at Portonovo, Italy, on the Adriatic Sea just south of Ancona. 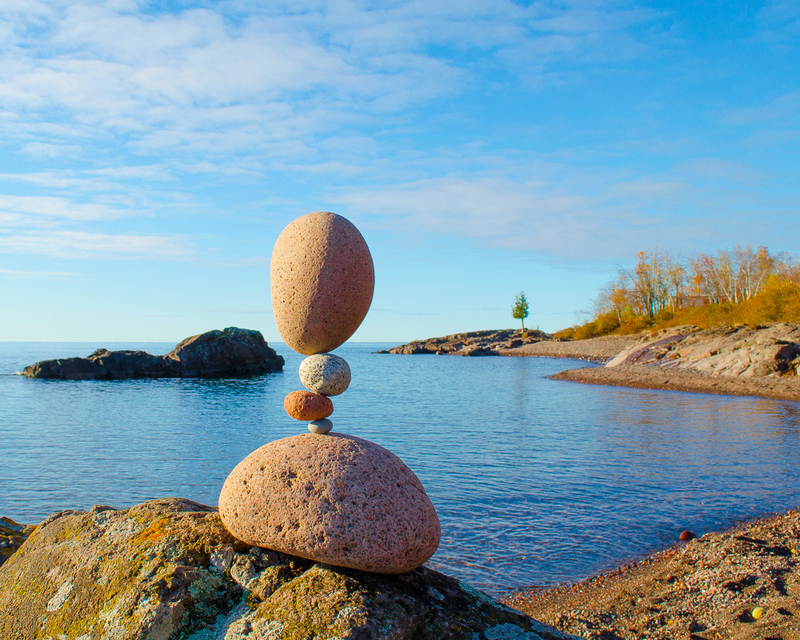 From BAWI 2012 - Balance Art World Intermeeting, the first ever international stone balancing conference. 2010: Constructed in a rock niche just across Highway 61 from the parking lot of Betty's Pies. 2013: I just find something whimsical about this piece. 2012: These individual balances were about an inch apart. The angle makes them seem to be almost kissing.